Do you find yourself drawn to metallics when it comes to picking out your home’s decor? If so, good choice! Staging expert Talia Malizia from AFR Furniture Rental explains why incorporating metallics is a great choice for any home, but especially when staging it for sale. Whether you’re thinking about selling your home in the near future, or are interested in sprucing up your home, we’re hoping you’ll find all the content being shared this week helpful! 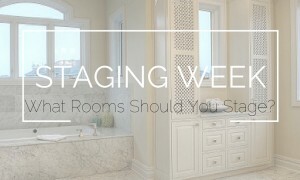 Join the conversation throughout Staging Week by chatting with us on Twitter. Check back tomorrow for new videos! Wondering what room or rooms need to be staged before you put your home on the market? We have the answer! No measuring tape? No problem. Staging week continues with a look at how to easily hang a mirror or picture on a wall.